So, you’ve set a date for your wedding and like every other would-be bride out there, you too have imagined and planned the ‘Cinderella-esque’ fairytale wedding. Here, In India, weddings are all about extravagance and the magnanimity (of course, with a little help from Mr. Karan Johar’s and Mr. Yash Chopra’s movies). 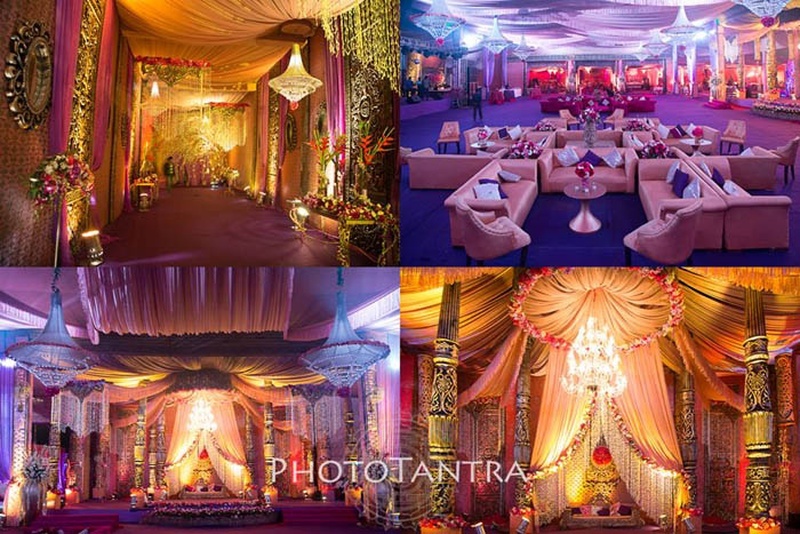 Banquet halls are in demand as innumerable wedding ceremonies and functions are held in banquet halls these days. You can easily organise any of your wedding functions in banquet halls without worrying too much about weather playing a spoilt sport at your wedding. Hence, getting the right kind of decoration done for your wedding banquet hall is imperative. Decorations are no more about the plain Jane white table cloths or simple lightings and a couple of those electric pedestal fans placed at some corner of the venue. Banquet hall decorations have evolved and how? You can always play around with colours, textures or just simply experiment with lightings or ways of draping while decorating a banquet hall. We bring you a couple of decoration ideas that you can include while you plan your wedding ceremony in a banquet hall. Yes, you can never go wrong by incorporating floral decoration while you plan on hosting your wedding function in a banquet hall. Flowers add a mesmerising touch to any wedding and you can easily give your reception tables or the wedding stage a decorative floral boost. Using colourful jars or wine bottles in the form of vases adds a tinge of vibrancy to the whole party hall decoration. It’s always best to know which flowers are in season so that you can always include those in your banquet hall décor ideas and charm your guests. Flowers like roses, dahlia and daisies are seasonal and can be fused according to the season, be it summer, winter or monsoon. Flowers like marigold, which are majorly used in a lot of Indian weddings, can be used at the entrance of the banquet hall. Also, refer to Love Flowers? 5 Mesmerising Floral Ideas for Your Wedding Decor for more innovative floral ideas to add a distinctive touch to your banquet hall decoration. As someone rightly said, “With the right light and the right time, everything is extraordinary”. Over the years, lighting has charmed its way into everyone’s hearts, especially when it comes to weddings. It is equally important to decide on the lighting based on the kind of party or function you’re hosting. It has this tremendous ability to set the right mood and ambiance for any kind of party of ceremony you plan to organise. Beautifully-coloured paper lanterns, candles or even chandeliers can amp up the ante when it comes to ideas for decorating a wedding banquet hall. So, once you have decided on the theme, make sure you transform your venue into something spectacular and ‘wow’ everyone with the incredible lighting arrangements. Lighting can brighten up your big wedding day in more ways than one. Don’t believe us? Then, check out Spruce Up Your Big Day with These Amazing Lighting Décor Ideas! for many such amazing lighting décor ideas. It’s your wedding day and there are no compromises when it comes to wedding decorations. One of the best ways of capturing your guests’ attention is at the start itself. Still didn’t understand? We mean by decorating the entrance of the banquet hall and making it look stunning. It can be done in the form of a simple yet elegant string of lights, brightening up the hall entrance. You can have sign boards with details of the wedding day or a banner image of the couple, which could also give out details about the couple’s journey. All you beautiful brides out there have to agree that elegance comes in many forms and stunning drapes and curtains are one of them. They have the ability to make any wedding look chic. Soft draping can mesmerise each of your guests and add a touch of suave and elegance to your wedding banquet hall décor. You can adorn pretty little lights wrapped in fabric or simply use ceiling canopies, room liners, stunning drapes for the stage or drapes as backdrops and make your wedding a gorgeous event. Those simple chairs can be made to look striking by tying burlap bows or pretty ribbons on the back of the chair to get your creativity flowing when it comes to fabrics and curtains. Simply choosing the right colour fabric can help determine the theme for your wedding—bright colours if you plan for something fun and white or champagne colour fabric for a more elegant and formal look. Gone are the days when they used lackluster chairs and tables at weddings to seat guests. Today, weddings have some quirky, elegant and sophisticated décor and designs even when it comes to chairs and tables. A lot of wedding functions and reception parties have beautiful floral decorations that give a surreal look to the whole venue décor. These days, a lot of coloured glassware is in trend as it is a unique décor idea. For seating, ribbon tassles can be a nice way of turning a simple backrest into something interesting. For pre-wedding or post-wedding functions, you can use cushion covers that are bright and bring life to the whole wedding functions. Tea lights in cute little mason jars or little string of lights in mason jars add a scintillating effect to your whole wedding décor. Check out DIY Beautiful Outdoor Wedding Décoration Ideas on a Budget for more seating space and table décor ideas.